I draw my inspiration from many sources; the waters and limestone cliffs of the Bruce Peninsula and the shorelines of Lake Superior and Georgian Bay. I am fascinated by the powerful forces that have shaped the landscape and the effects that time and weather have had upon the earths' surface. Water in particular has fascinated me since childhood. I delight in the discovery of rhythmic patterns created by light as it passes through water, by the ripples on its surface and how it transforms and distorts what lies beneath. These patterns inspire me not just for their beauty, but because they suggest an underlying natural order. of Margarethe Vanderpas and is protected by international copyright laws. Use of nature art, wildlife art or any other images or text from this site, requires permission in writing from Margarethe Vanderpas (). This site is part of the Artists for Conservation (AFC) Web site. (Wildlife Art - Nature Art - Conservation) Artists for Conservation is an international, non-profit organization dedicated to nature art, wildlife art and conservation. On this site you will find world-class nature art and wildlife art by today's leading nature artists & wildlife artists. The AFC site is the Web's premier location for nature art, wildlife artists All content appearing in pages featuring Margarethe Vanderpas is the sole responsibility of Margarethe Vanderpas. 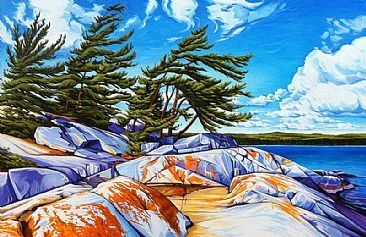 The opinions expressed on these artists' pages are those of Margarethe Vanderpas and do not necessarily reflect those of the Artists for Conservation Foundationi (AFC).